Xiaomi Mi Mix 2S VS Xiaomi Mi Mix 2: The Battle Of Mi Mix. Chinese company Xiaomi has rapidly gained market share in the world of technology. The company released their first smartphone in 2011. They became China’s largest smartphone company in 2014. And by 2017, they are already world’s 5th largest smartphone company. Their smartphones are relatively affordable and user-friendly. They produce high-end and mid-range smartphones. For this article we would be looking at their 2018 Xiaomi Mi Mix 2S and 2017 Xiaomi Mi Mix 2. The Xiaomi Mi Mix 2S comes with some of the latest trending specifications in the smartphone market. But how much of an upgrade is it from Xiaomi Mi Mix 2? The Xiaomi Mi Mix 2S and Xiaomi Mi Mix 2 comes with a front glass with aluminum frame, and a ceramic back. While the Xiaomi Mi Mix 2S measures 8.1mm slim compared to Xiaomi Mi Mix 2 that measures 7.7mm in thickness. The Xiaomi Mi Mix 2 is slightly lighter (185 grams) than the Xiaomi Mi Mix 2S (191 grams). The fingerprint sensor is positioned at the back of both smartphones. While the Xiaomi Mi Mix 2S dual rear camera is in a vertical position at the top-left corner, just like the iPhone X. The rear camera of the Xiaomi Mi Mix 2 is at the top-middle. Xiaomi however didn’t offer much option on the body colors of the two smartphones. They are both available in only black and white body colors, which isn’t all that good. Won’t be bad to have some fancy color smartphones like pink, gold, purple e.t.c. Quite similar display design on both smartphones. They both feature tri bezel-less with the front camera placed after the bottom end of the screen. Xiaomi Mi Mix 2S features a 5.99 inch screen with 81.9% screen-to-body ratio. While Xiaomi Mi Mix 2 features a 5.99 inch screen with 80.8 screen-to-body ratio. Wonder why Xiaomi didn’t use the trending AMOLED screen, at least for Xiaomi Mi Mix 2S. Instead, they both feature the IPS LCD capacitive touchscreen. Which most high-end smartphones are beginning to ditch. The screen on both device is protected by Corning gorilla glass 4. They both have a display resolution of 1080 x 2160 pixels and 403 ppi density. Both phones have good camera quality. With Xiaomi Mi Mix 2S an upgrade in this category. Xiaomi Mi Mix 2S sports a dual: 12MP f/1.8 aperture and 12MP f/2.4 aperture rear camera with dual-LED dual-tone flash. While the Xiaomi Mi Mix 2 comes with a 12MP f/2.0 aperture rear camera with dual-LED dual-tone flash. In the front camera, the Xiaomi Mi Mix 2S have a resolution of 5MP f/2.0 aperture. The same 5MP f/2.0 aperture front camera is on the Xiaomi Mi Mix 2. 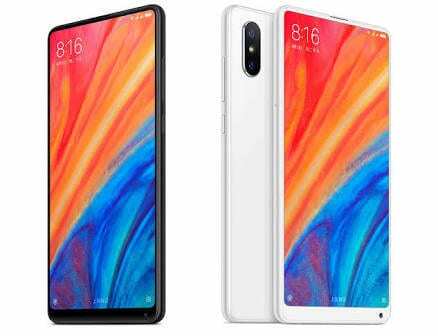 Running under the curtain for Xiaomi Mi Mix 2 is the Qualcomm Snapdragon 845 chipset with a Octa-core 2.8GHz processor. While on the Xiaomi Mi Mix 2 is the Qualcomm Snapdragon 835 chipset. And a Octa-core 2.45GHz processor. The Xiaomi Mi Mix 2 runs on Android 7.1 Nougat which is an outdated version. While Xiaomi Mi Mix 2S runs on Android latest operating system, Android 8.0 Oreo. In terms of RAM and ROM/Internal storage, both phones offer almost the same variants. There is a 8GB RAM with 256GB ROM on both Mi Mix 2 and Mi Mix 2S. And a 6GB RAM with either 64GB or 128GB ROM on both Mi Mix 2 and Mi Mix 2S. While the Xiaomi Mi Mix 2 have a 6GB RAM with 256GB ROM variant. They both come with a non-removable Li-Ion 3400 mAh battery. And Fast battery charging (Quick charge V3.0). The Xiaomi Mi Mix 2 is available at about $505 (N176,750). While the Xiaomi Mi Mix 2S is sold at around $640 (N224,000). Aside from the camera quality and hardware, both phones virtually offers the same features. But unfortunately the camera and hardware are key specifications in modern day smartphones. So the Xiaomi Mi Mix 2S will be worth your money here.